Production: Reverb-heavy and gritty but somehow appropriate presence. Review: Taking heed from the promise shown by Emperor, Ancient and Graveland, the Austrian mystical metal horde Summoning expand on the idea of wandering melodies in black metal by slowing down the music, making longer melodies of interchangeable parts, and dropping guitar to a background instrument whose rhythm and melody complements that of the keyboards. Vocals reduce to a timekeeper along with simplified, less-explosive drumming, which allows the keyboard-guitar interplay to take center stage. This is turn places focus on song structure, which is based around the concept of layers, allowing instruments to work together in varying degrees to create dynamics. However, there's also the interchangeable nature of these melodies, which means they suggest one another, which gives the impression of a single melody evolving as pieces of it repeat, and are then seen in a new context after another piece of the puzzle is played, then the original returns. 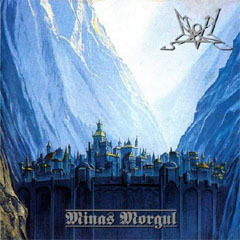 This album is about the peripatetic approach to struggle in life as exemplified by Tolkien's "not all who wander are lost," and it mimicks this tendency with melodic lines that drift through circuitous mazes of themselves before resolving into more discrete themes harmonizing with their previous tributaries. The careless grace and fearless variance promote a sense of worship for a life including both death and life, which complements the negativity worship of black metal with a sense of potential adventure behind every turn.